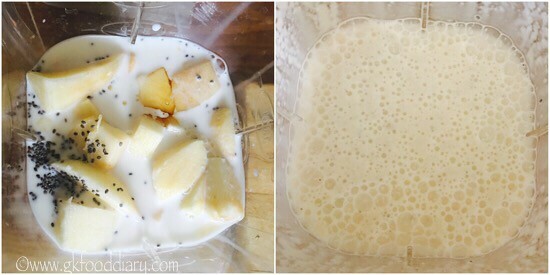 Apple banana milkshake – creamy delicious milkshake for babies, toddlers and kids with chia seeds. After reading many health benefits of chia seeds, I wanted to try some recipes with it from long time! But was doubtful how the taste would be, believe me it tasted good! Here comes my first recipe with chia seeds! Chia seeds are less allergenic in nature and can be introduced to babies diet from 10 months after baby’s tummy is adjusted with some basic foods and good digestion is developed. Raw chia seeds are not easily digestible for some babies, hence always use soaked chia seeds for baby food preparations. Chia seeds are good for your baby if consumed in moderation, say 1 to 2 tsp per week. As with any new food, have a word with your doctor before introducing chia seeds to baby. 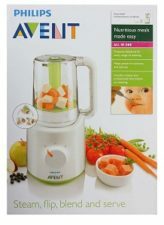 Loaded with omega 3 fatty acids, hence good for babies brain and eye development. Its a good source of energy, keep kids active and energetic. High in dietary fiber, so good for constipation. Good source of protein helps in organ development. 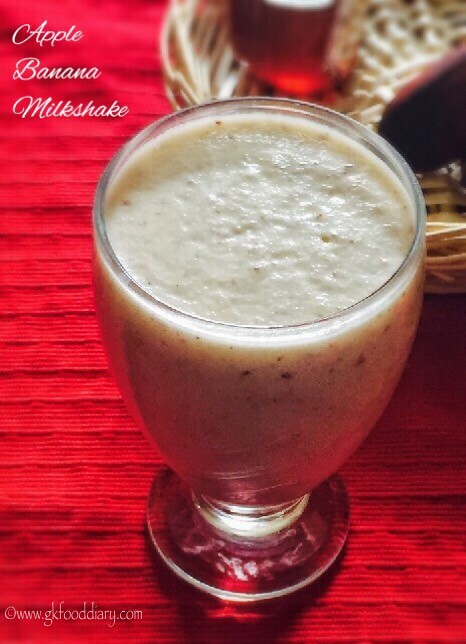 Now Lets get on to check how to make the apple banana milkshake for babies, toddlers and kids. Soak ½ tsp of chia seeds in1/4 cup of water overnight. Next day it turned out like gel. Use this to your milkshake. Keep all the ingredients ready. Soak almonds in warm water for 10 minutes. Then peel the skin of almonds and set aside. Wash the apple in running water thoroughly. 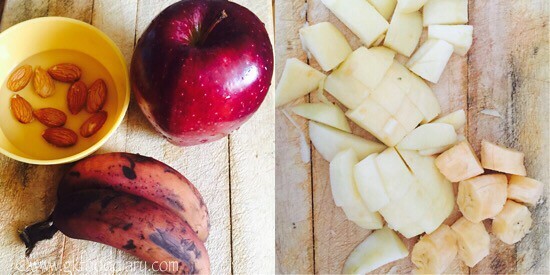 Peel the outer skin off from the apple using a peeler. Then cut them into cubes and discard the seeds. Peel and slice the bananas, keep it ready. Then take the chopped apples, bananas, chia seeds, peeled almonds and milk in a juicer/blender along with honey/sugar (if using). Blend everything till smooth. 1. Soak 1/2 tsp of chia seeds in 1/4 cup of water overnight. Next day it turned out like gel. Use this to your milkshake. 1. Keep all the ingredients ready. Soak almonds in warm water for 10 minutes. Then peel the skin of almonds and set aside. 2. Then take the chopped apples, bananas, chia seeds, peeled almonds and milk in a juicer/blender along with honey/sugar (if using). Blend everything till smooth. 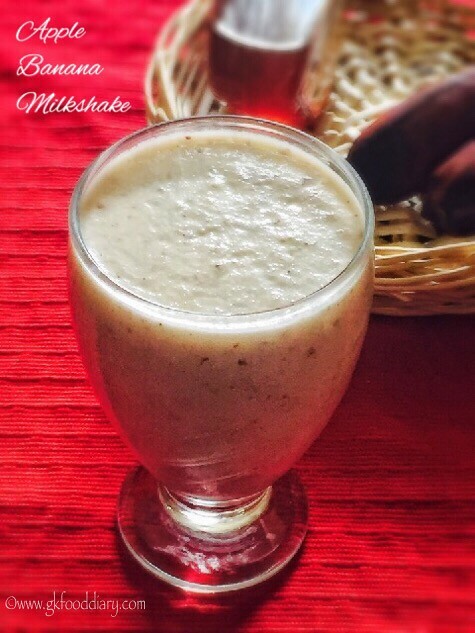 The creamy apple banana milkshake is ready. Serve chilled !!! 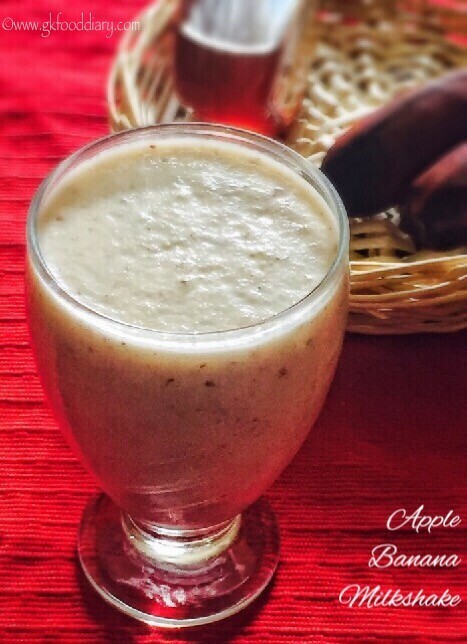 Make sure to introduce apple, banana and cows milk separate before you try this apple banana milkshake. I have added raw chia seeds, but soaking is highly recommended for small babies and kids to ensure easier digestion. For babies below one year, avoid cows milk & honey. Use breastmilk or formula milk instead. Always remember that breastmilk or formula should be major for babies until one year hence prefer juices/smoothies occasionally. You can skip chia seeds if you couldn’t source them.